Blackmagic Forum • View topic - iMac Pro user experiences? I'm curious to hear stories from anyone beginning to user the new iMac Pro. Re: iMac Pro user experiences? As a RED user I can say it's been really great so far. I have 10 core/64GB RAM/Vega 64 GPU/4 TB SSD. I also have a Red Rocket-X connected via TB3 in a Sonnet box. It cuts through 8K files like a knife through hot butter. Today is literally the first time in years that I felt like my computer was helping me work faster rather than holding be back. There are a few times I can remember such a large step-up in performance. Moving from floppy disks to a 10MB hard drive in 1976 (Cromemco Z2-D); moving from Sun 2 to Sun 3 workstation (1986); moving from SPARC to MIPS R10000 (1996); moving from Pentium to dual-Xeon (Mac Pro 2008); and now. It's a big deal--and not a moment too soon. I've been using a 2012 Mac Pro and a 2013 new Mac Pro, and both have long fallen behind what my cameras have been demanding. Now I feel like I'm back to being able to do creative things without constantly bumping into performance limitations of one sort or another. Which feels great! May I ask about heat and noise? Plus, regarding the Red bug under current High Sierra, I suppose you run it under Metal? I'm using the default, reported to be OpenCL. It just works. Noise of iMac pro much less than spinning disks and Sonnet expansion box. Headphones help. Thanks for the report. How does it run without the Red Rocket (which, at $6500, costs almost as much as the entire computer and is I imagine a large part of the performance step up)? I saw results from a Geekbench 4 Test in which Metal performed very slightly worse than OpenCL. Didn’t expect that. 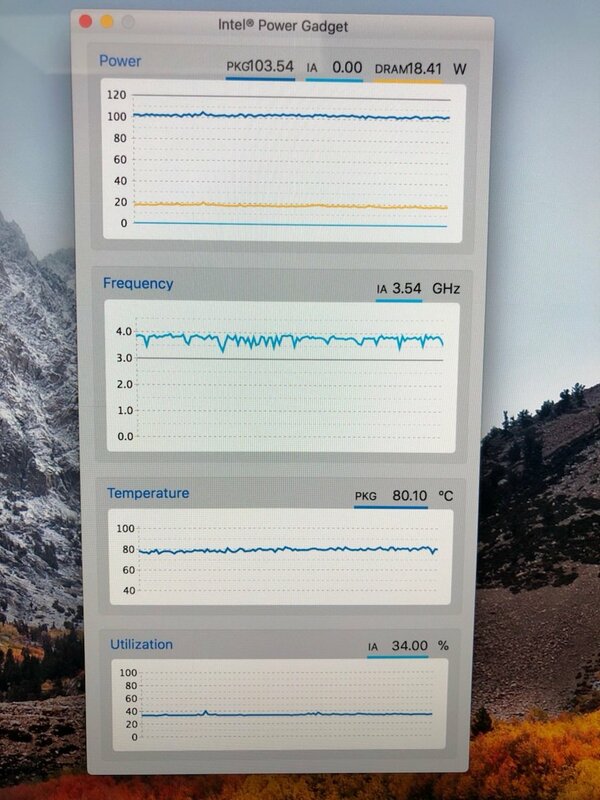 One peculiar aspect I’ve seen reported (AppleInsider and confirmed by other early adopters): the iMac Pro attempts to keep the processors cool by throttling the clock so your CPU may be running at 3.9 GHz but will slow to 3.1 GHz until the processor is cooler and then it ramps up to 3.9 GHz and the cycle continues. Eventually after awhile the system will ramp up the fan to help keep things cooler. That dynamic variable clock may mean this isn’t a gamers’ machine, but that’s not likely a concern for most of us. Overall though I echo Michael’s comment about editing video on the 10 core machine: like cutting warm butter. Michael, can you do me a favour and run the Blackmagic Speed Test on the 4 TB internal flash with 128 KB block size? Love to know how well it’s going to handle BMD video with the maximum internal SSD. Posting a sample screen capture if the he Speed Test results would be interesting to see. Saw in i-fixit teardown that the drives are 2 in raided formation . Can you try a long render and see what the temp does ? That would be "the" number one biggest question mark we all have after the trashcan debacle. Michael Tiemann wrote: As a RED user I can say it's been really great so far. I have 10 core/64GB RAM/Vega 64 GPU/4 TB SSD. I also have a Red Rocket-X connected via TB3 in a Sonnet box. It cuts through 8K files like a knife through hot butter. Today is literally the first time in years that I felt like my computer was helping me work faster rather than holding be back. It just shows how much behind Apple was/(still is) in terms of workstations. Well- they don't have one, simple as this. Even new Mac Pro is not a real workstation replacement. What about noise during heavy working (without headphones on ears)? I would also like to see CPU/GPU throttling graph on long terms renders etc. To compare to Michael’s screenshot with the 4 TB internal flash storage, another person tested with a 2 TB 10-core and had 2,996 MB/sec Write and 2,450 MB/sec Read. I know every time you run these tests you’ll get some variations with no parameters changing. So it looks like there isn’t a significant performance difference between 2 TB and 4 TB SSD options. Per Marc Wielage's question about the Resolve UI on this display, any problems? i have a cleint asking me about this machine, has anyone done a 72hr stress test, full load in normal -to- cramped office space conditions? Dermot Shane wrote: i have a cleint asking me about this machine, has anyone done a 72hr stress test, full load in normal -to- cramped office space conditions? I have a 23-hour render session under way on the 10-core model (55 hours of C300mk2 footage transcoding to ProRes). I'll keep you posted! It's been a few hours and I don't even hear the fan, it's much more quiet than the maxed out regular 2017 iMac, surprisingly. There's plenty of hot air coming out of the back vent, but the fans are bigger/quieter. The machine is barely warm after hours of all 10 cores running full blast, I'm impressed. I did a few tests (exported the same project, a 42mins tv show) on my 3 machines (2012 12-core MP with Titan X, 2017 iMac maxed out and 2017 10-core iMac Pro with Vega 64) and the iMac Pro is much, much faster, more so than anticipated. Now I kinda want to buy the 18-core. I'll report the details of my tests when I have a moment. Last edited by Francois Dompierre on Sun Dec 31, 2017 2:43 pm, edited 1 time in total. rick.lang wrote: I know every time you run these tests you’ll get some variations with no parameters changing. So it looks like there isn’t a significant performance difference between 2 TB and 4 TB SSD options. You need to be careful when doing tests like this, because depending on who wrote the testing software, the OS settings, and the amount of ram free, you can get highly inaccurate results. Both OS X and Windows will use RAM as a cache. Thus to ensure accurate results use the largest possible sample sizes. Dermot Shane wrote: Merci Francois! The render finished without problems, stayed cool and quiet all the way. Apple designed quite the cooling system. You can tell the classic iMac's cooling system is getting near its max design capacity with the 2017 maxed out iteration (you often hear the fans, and the iMac does get hot). But the iMac Pro's cooling design is plenty sufficient for the current iteration of the iMac Pro (and has room to accommodate more for the next couple of years no doubt). With all cores working full blast on both machines, the iMac Pro is roughly twice as fast! Both machines have 32GB of RAM, and the export was going from one SDD drive to another in both cases, so drives do not account for the difference. Given the performance and cooling efficiency of the 10-core iMac Pro, I think the 18-core model is well worth it. Both Xeon chips are 140W, so the cooling performance should be identical. But 18 cores @ 2.2 vs 10 cores @ 3,0 -- roughly 25% faster I guess, if we extrapolate total GHz? That's an expensive upgrade for just 25% more. Maybe the 10-core is the sweet spot if budget is an issue. But if budget is no issue, I think the 18-core is going to be just as cool and quiet as the 10-core. Last edited by Francois Dompierre on Wed Jan 03, 2018 12:12 pm, edited 3 times in total. Now it would be nice to see clock speed for CPU and GPU during such a render. Question is- how much was clock reduced during this render? If it's just slightly or not at all then great. If there was a big reduction then your 10 cores CPU is not used very well at all. It's like many laptops which have powerful CPUs, but never use 100% of their power for more than 5min. Francois Dompierre wrote: Given the performance and cooling efficiency of the 10-core iMac Pro, I think the 18-core model is well worth it. Both Xeon chips are 140W, so the cooling performance should be identical. When all cores are working, the 18-core chip runs at 2.2GHz vs 3.0GHZ for the 10-core, and that's how it stays at 140W. But 18 cores @ 2.2 is still going to be faster than 10 cores @ 3,0. The question is by how much. Roughly 25% faster I guess, if we extrapolate total GHz? That's an expensive upgrade for just 25% more. Maybe the 10-core is the sweet spot if budget is an issue. But if budget no issue, I think the 18-core is going to be just as cool and quiet as the 10-core. so in theory 18 cores is about 30% faster, but in reality this is going to be probably less, e.g. 20% and in some tasks it may end up that 10 core version is actually faster (due to much higher clock). Andrew Kolakowski wrote: Now it would be nice to see clock speed for CPU and GPU during such a render. With all cores running, the Xeon chips do not throttle below their rated speed. You can expect a minimum of 3.0GHz with all cores running, and something between 3.0 and 4.3 when less cores are in use. Same for any Xeon chip, in PC or Mac. Difference is, in a bigger box (PC or Mac) with better cooling, they will on average stay at a higher clock (closer to 4.3 than 3.0). But if you look at the Xeon chips available in the latest HP Z-class workstations, they are CRAZY expensive. The more affordable options do not go all the way to 4.2, so it would appear that the iMac Pro is not that expensive after all. Man, Intel makes a ton of money on those Xeon's!! It will be interesting to see if Threadripper forces them into lowering their prices. if you look at the Xeon chips available in the latest HP Z-class workstations, they are CRAZY expensive. The more affordable options do not go all the way to 4.2, so it would appear that the iMac Pro is not that expensive after all. Can't report good or bad so far as the migration from Time Machine backup produces error permissions messages saying Resolve does not have permission for cache clip/.gallery/Capture paths and I can't update them in project settings. Also, very strangely cannot give read/write permissions to any user, administrator or myself or add additional users. Apple techs did some root level processes through the terminal that they were very surprised to find din't fix the problem. Of course, with a brand new machine they have been very attentive but were unable to find a fix. Supposedly they are spending their holiday trying to figure it out with a phone conference on Tuesday morning, but I am beginning to suspect that it may be a resolve 14.0.1/OS 10.13.2/PostgreSQL issue. I'm planning to post elsewhere in more detail to see if I can get some response to potential upgrade issues unrelated to iMac Pro. Frustrating to not have any sense of what this thing can really do! As I stated previously, the 10-core under load is throttled to keep the temperature moderate and the fans fairly constant. The 10-core seems to run mostly at 3.9GHz and dips briefly to just below 3.2GHz until the temperature drops and then quickly resumes using 3.9GHz. So most of the time with multiple cores active, you get much more than Apple’s published clock speed. I'm more interested in the thermals for the 18c model. Glad to see Apple actually innovated with the cooling in the Pro, but such a packed chip could still be a nuclear inferno on long jobs. Yeah but the Z6 is 30% off today only (year-end sale) and it doesn't include a 5K screen, and you're comparing Max Turbo boost speeds to minimum base guaranteed speeds in the procs, so not exactly fair But I guess thats's the million dollar question, what's the actual speed of those chips when under full load on all cores for a long time? Regardless, Mac or PC, I've worked with both over the years and in the end there are a lot of good options and what matters most is what we do creatively with those beautiful machines! Happy New Year guys! Last edited by Francois Dompierre on Sun Dec 31, 2017 11:59 pm, edited 2 times in total. rick.lang wrote: As I stated previously, the 10-core under load is throttled to keep the temperature moderate and the fans fairly constant. The 10-core seems to run mostly at 3.9GHz and dips briefly to just below 3.2GHz until the temperature drops and then quickly resumes using 3.9GHz. So most of the time with multiple cores active, you get much more than Apple’s published clock speed. What, that's good news! What utility are you using to monitor the CPU clock speed under macOS ? If 2 or 4 cores are only active then that's normal that clock is raised to turbo speed even for long time. My question was about 100% load for e.g. 6H. This will show how cooling is performing. Fact that Mac can stay cool during heavy load over long time is one "good" thing. If during this time clock is going to be lowered to e.g. 2.5GHz this means that there is a compromise compared to PC workstation based on the same CPU. HP won't run forever at turbo speed at 100% load, so this is not fair comparison. It still doesn't change fact that HP can have dual Xeons. At the end these are the same CPUs. My question is how much Apple slows CPU (also GPU) during long processing at 100% load. So it takes only 30 seconds for 8 core CPU to hit max allowed temp when GPU is also utilised quite heavily. All of their tests were rather short e.g. (12min), but they are promising. The only worry is that even 8 cores CPU is very quickly operating at 94C. This is very high, but the good point is that iMac wasn't noisy according to article, so maybe with manual fan control it can be cooled better (for e.g. overnight render). That's not how the turbo boost works. You have a base clock, an all core boost clock, and a max single core boost clock. The marketers only talk about the core clock, and the single core max boost clock. for example, if memory serves this is the 10 core chip in the imac pro. All core boost is usually 100 or 200 Mhz over the core clock, so lets say 3.5 GHz. The only way you are running all cores at maximum frequency is with an unlocked and custom cooled chip, and you can't do that with any Xeons. Based on your post I assume you where monitoring the OS performance metrics, and to be frank those are crap, regardless of what OS you are using. To see what your machine is really doing you need third party monitoring software that isn't trying to dumb down the information for the lemmings of the world. François, see AppleInsider reviews and tests of the 10-core iMac where they describe the near constant fan and the cycling of the CPU clock. This also confirms that iMac's Pro CPU runs at high temp overall. It's fine somehow, but shows that cooling is stressed a lot. 80C at 34% CPU load- quite high temp again. Many heavily overclocked PCs (when done well) never go above eg. 75C. 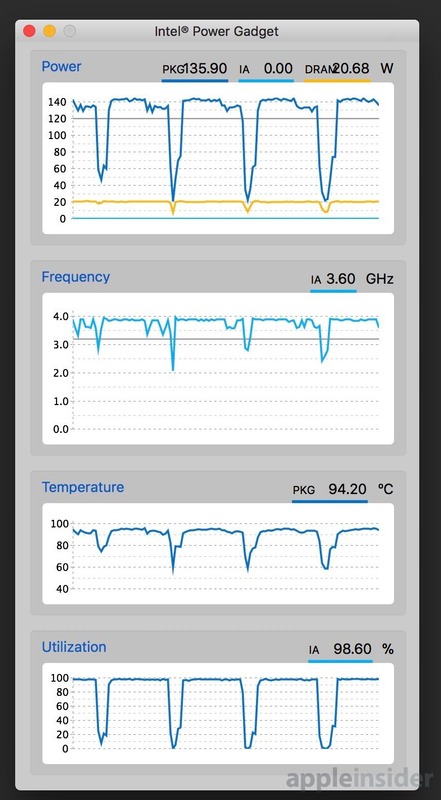 I've noticed the same on my Macbook Pro that any stress for CPU means very high temp. rick.lang wrote: François, see AppleInsider reviews and tests of the 10-core iMac where they describe the near constant fan and the cycling of the CPU clock. Thanks Rick! I looked at the article, very interesting info, and it looks like the iMac Pro CPU is performing very well indeed. I was expecting the chip to stay at the base clock of 3.0 when all cores were in use, but we get way more than that. Can't wait to see how the 18-core performs in that regard (throttling, base clock, all cores working, etc). Last edited by Francois Dompierre on Mon Jan 01, 2018 8:04 pm, edited 1 time in total. What is minimum throttling, 10%? Is CPU temp at around 95C? Does Mac Fan Control app not working yet with iMac Pro? Here's what my 10-core looks like after 30mins of all 10 cores rendering in Resolve (50% utilization = 100% of real cores and 0% of hyper threading cores, which Resolve doesn't seem to be using for this particular export). The computer is barely warm and the fans are very quiet... The CPU stays at around 90C, which is within spec (I checked on Intel's website). I barley get any throttling and I have sustained 3.8GHz on all 10 cores, not bad at all. I'll report back if it changes after a couple of hours... but I don't see why it would change, half hour of 100% rendering is as hot as it's gonna get... if the room temp stays the same... So basically this CPU has plenty of room to clock down when in really hot environments (which Apple has to account for when designing computers). I get 3.8 in my 20C/70F office, but someone in a hot apartment in Dubai with no AC might get 3.0..? Now I really want to see how the 18-core performs, and what average GHz it stays at during an 18-core render session (in a properly temp controlled environment). Where did you see 90C was ok? I find that temp highly suspect, as 95 to 105C is usually within thermal shutdown range. It's usually advised to keep temps in the 70 to 75C range or lower for Intel chips, with momentary jumps (a few seconds) over 80C ok. Sustained periods over 80C usually leads to a substantially shortened life span do to thermal degradation. Those temps really high. Apple does allow for CPU to go to very end if its ability, which is good, but in the same time bit worrying. I hope at some point there will be an app to control fan speed and force it to higher RPM to get bit lower temps. There may be some logic to slow down CPU after it operates to long at such a high temps. Found an article, showing some pretty severe throttling. It's the same article which I posted. There is no throttling there. Are you talking about turbo speeds? Andrew Kolakowski wrote: It's the same article which I posted. Andrew Kolakowski wrote: There is no throttling there. Are you talking about turbo speeds? I'd call this throttling! At one point the Frequency drops to just above 2.0 GHz, and CPU usage dropping to almost zero several times. That looks like an illustration of multiple consecutive runs, as discussed in the article. The 0% CPU utilisation areas are the areas where the tests aren't running. And as there's no utilisation, there's no need to keep the processor running at max clock, so it doesn't. I'm fairly certain that if the benchmarks had caused the CPU clock to drop that low, the article would mention it. Simon Brown wrote: That looks like an illustration of multiple consecutive runs, as discussed in the article. The 0% CPU utilisation areas are the areas where the tests aren't running. And as there's no utilisation, there's no need to keep the processor running at max clock, so it doesn't. I'm fairly certain that if the benchmarks had caused the CPU clock to drop that low, the article would mention it. Check the video at about 1:05, to me Max makes it sounds like it was going on during the individual test runs. The video says exactly the same thing the article says. After the second test, each additional run would cause the iMac Pro to slow down the CPU when the temperature reached roughly 94C, which caused the clock speed to drop from 3.9ghz to about 3.6ghz for a second or two. This allowed the CPU to drop below 92C, and the clock speed to rise back to the maximum turbo boost of 3.9GHz. Nothing about the clock speed dropping to 2GHz. Then something isn't right with the graph, or his explanation, because at several points the frequency graph drops down below 3.6Ghz and it's still showing ~100% cpu usage. Simon Brown wrote: Nothing about the clock speed dropping to 2GHz. Those dips last only few seconds. There is no time scale on these graphs which can be misleading. It needs proper test for few hours etc, not few minutes. Then you can really tell how much CPU is throttled (and if at all). What I am pointing out is, neither the article nor the video mentions those, and as I said earlier, as they coincide with CPU usage dropping to zero, they're likely in between runs of the benchmark. I don't consider clocking the CPU down when it has nothing to do to be a problem.